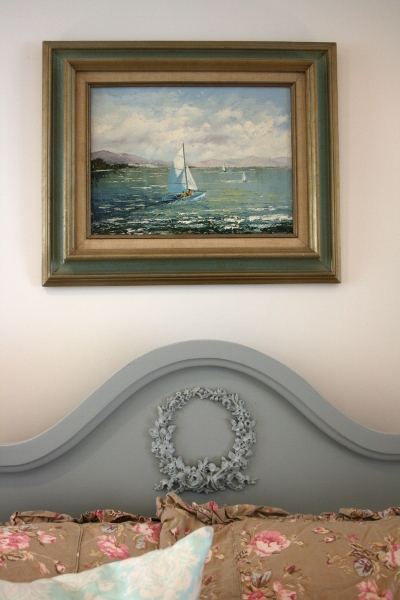 Last week when I shared my newly refinished nightstand, it occurred to me that when I refinished this headboard last year (yes, you read that right) I never shared pictures of it, either. 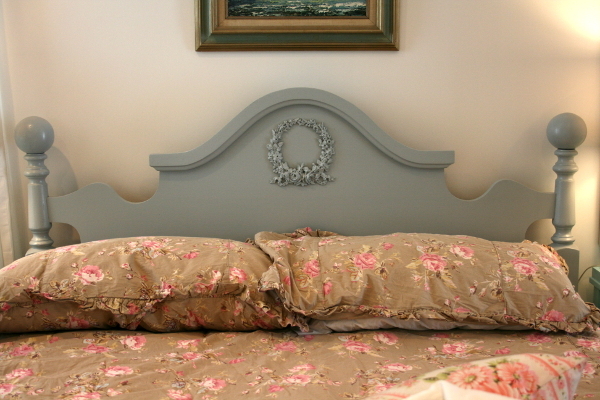 Since it’s my favorite headboard in the house, and since the nightstand sits next to it, I decided to share it now. 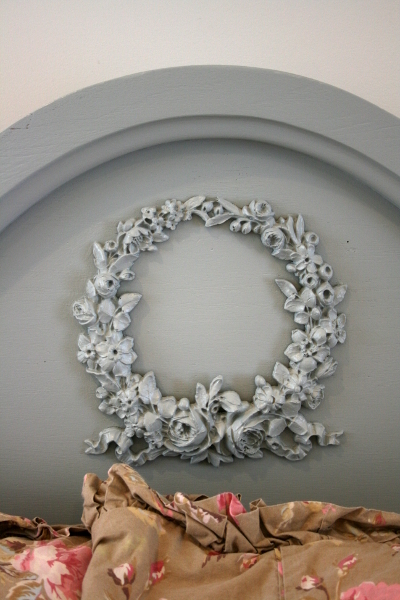 The original detail at the top of the arch was dated so I removed it, sanded the entire piece, added the wreath and painted the entire thing a soft gray. I change the duvet cover at whim and both the color and the headboard have looked beautiful with everything I’ve had on the bed. 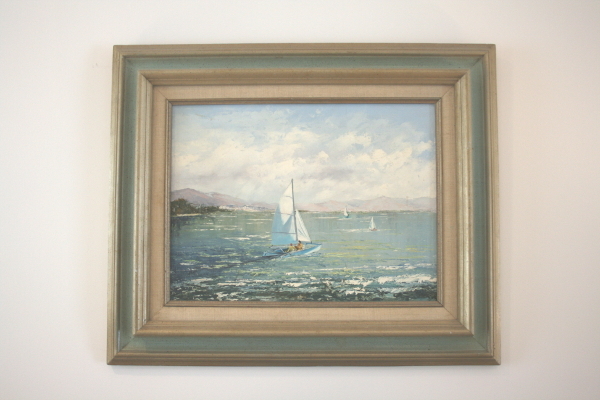 Above hangs a vintage oil painting – the only one I’ve ever fallen in love with – that my Mom bought for me a couple of years ago. I love it and it’s perfect in my home. 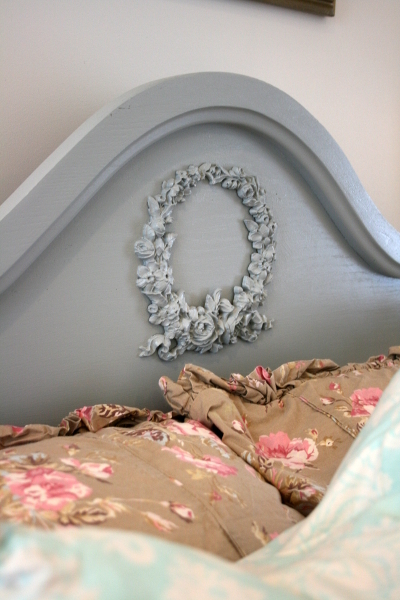 I love the way the wreath gives the headboard a vintage feel while the gray keeps it fresh. And even though it’s been a year, it still feels good to have completed it. 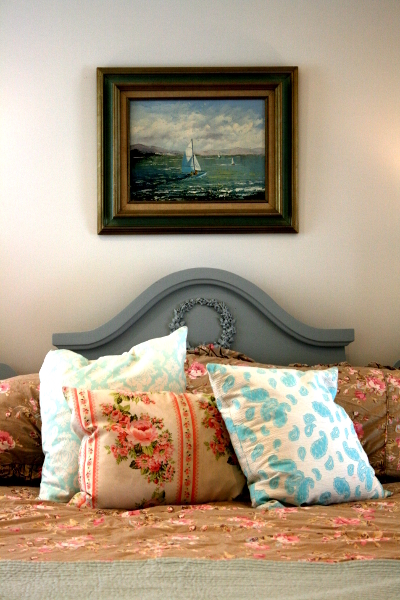 I am happy with it every time I walk through the room and hope it’s added to the comfort and beauty of our guest bedroom when we have friends and family in town. 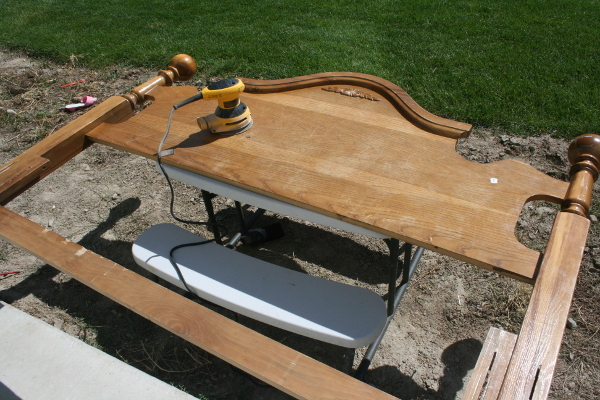 I picked this little table up at Deseret Industries FOREVER ago for $15. It had good bones, nice lines, and when I opened a drawer to check its condition, I found the Ethan Allen brand burned into it, also identifying it as solid birch. 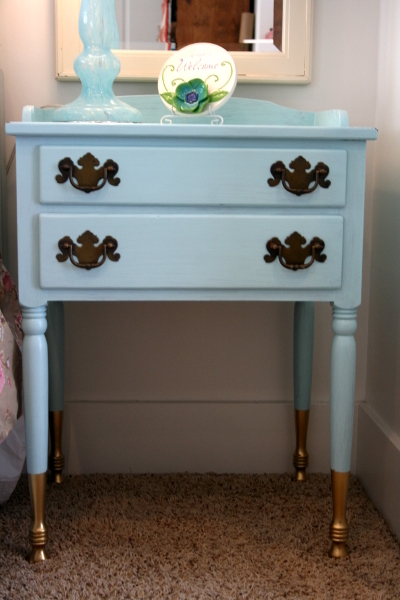 It had an ugly stain on the top so leaving it was not an option, so it came home with me to be re-painted. I sanded it, then painted it navy blue, and then painted the aqua on top of that. I wanted it to wear with that darker blue beneath it to show through when it gets scuffed over time, as has already happened thanks to my eager children. 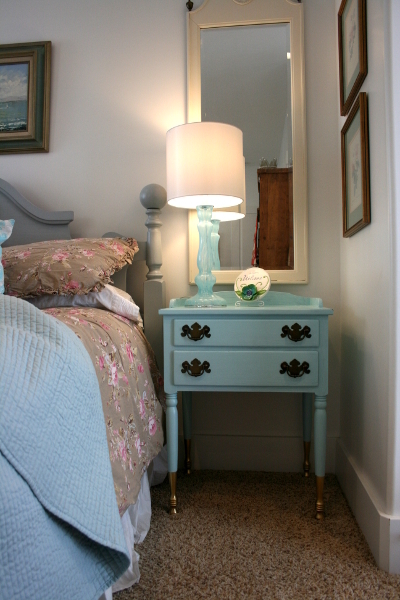 I kept the original brass drawer handles and like how they stand out. But my favorite part of all might be the legs. 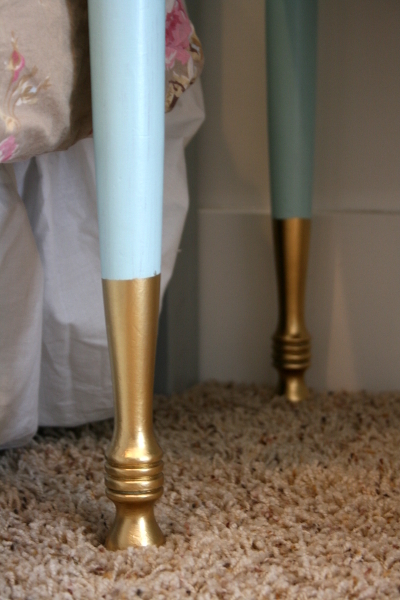 I painted the bottom six inches of each leg metallic gold and I’m totally hooked. In fact, I talked my daughter into letting me do the same thing on a project for her room as well. I’ll share more on that soon. And I’m wondering what else I can paint gold. 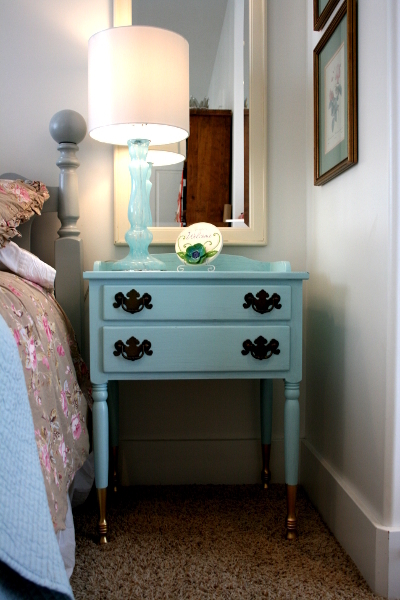 This little table fits perfectly next to the bed in our guest room/studio. I’m happy with how it turned out and grateful to cross a project off my list. That always feels good, doesn’t it? Soooo, I ended up bringing home a few new things. 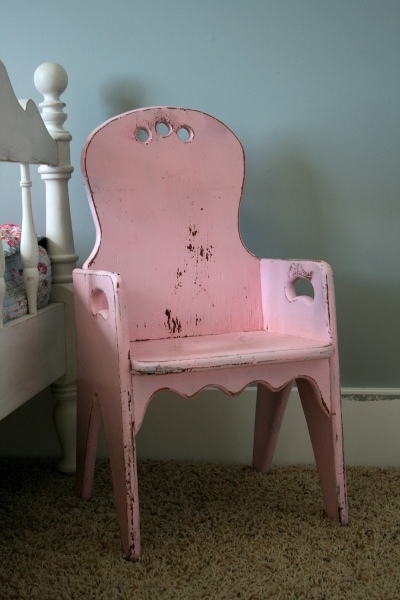 I have a weakness for vintage children’s chairs and this pink one had me at hello. I love the sweet details on it, from the holes to the handles to the scallop detail below the seat. 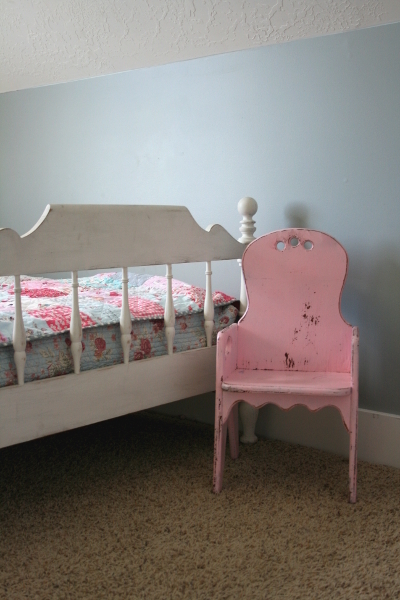 It’s also the perfect kind of vintage – still sturdy but distressed in all the right places. And pink. I really do like pink. It’s the perfect size for my youngest who was turning four the next day so it came home and became one of her birthday gifts. I’m happy with how much fun she’s having with it, and also with how it looks in her room at the foot of her bed. 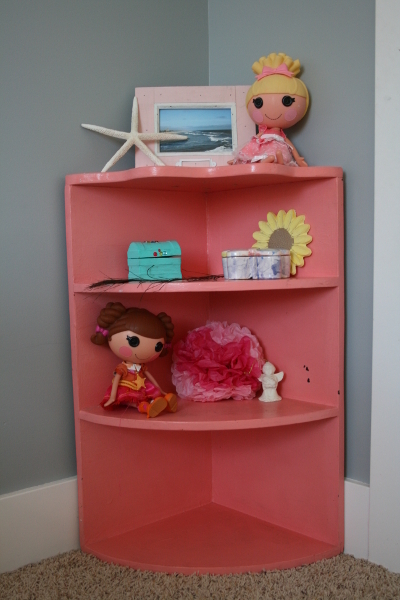 The second item is this coral colored corner shelf which fits perfectly in the corner next to her closet. 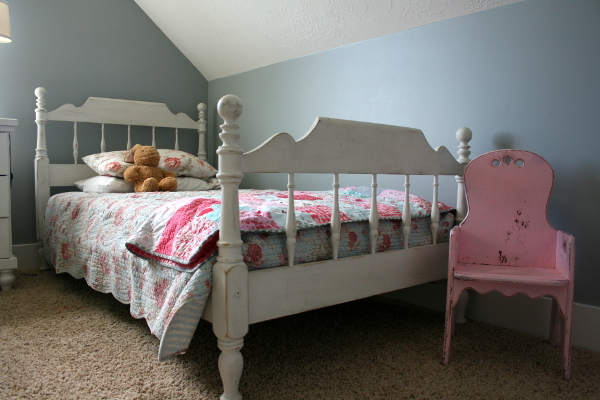 I’m trying to help my little girls with clutter – they take everything to their room! So far they’re loving the shelf and it hasn’t been overloaded with stuff. There is still a lot for me to do in here since painting the walls gray. 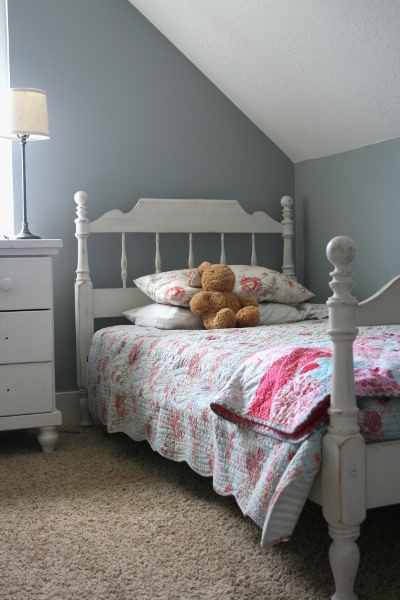 When it’s clean, I love the simplicity of what we have in there and I especially love this bed, from a yard sale in Denver (thanks again, Dad!). There you have it: my two new finds. I actually bought a couple of other things as well, which I have big plans for. It’s Labor Day weekend, which is kind of the last big hurrah for yard sales. Are you out finding something awesome? I hope you have a relaxing few days!